What I love about giving up refined sugar is all the creative ways people look to recreate chocolatey treats. I love the use of coconut milk 🙂 all I can say is oh yum they look scrumptious! Thanks to Hungry Club! I was always the BIGGEST fan of bounty chocolate bars. 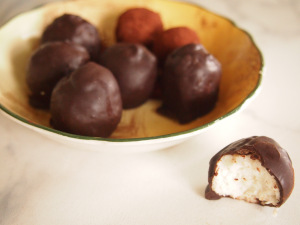 The chocolate shell, the coconutty centre – a combination of flavours I completely love. It was one of my favourite special snacks. More recently (after I decided to learn to make more things from scratch) I tried my hand at my own version of these favourite chocolates. 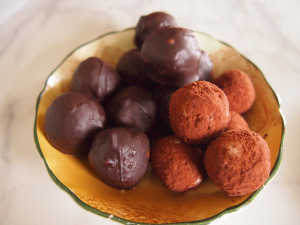 You can make them as bars or truffles but I find truffles to be the easiest snack size and also less messy to coat in some delicious dark chocolate.